Here we are again. Another Saturday, another Caturday. I find this makes more sense in my life than “another day, another dollar” because I have absolutely no money, but I do have cats!!!!! My previous post was a sincere apology for missing last week’s Caturday and there was no way I was going to miss it two weeks in a row. This week’s cat is one that made me snort in the middle of my theology class, one so loud that I then had to turn it into a weird cough/laugh combo and then proceed to jump out the window because my fellow classmates were trying to shoot me with laser beam eyes. CATS LOVE IT!!! There is nothing but pure joy on this feline’s face. I can’t imagine anything more enjoyable in it’s entire life, even when measured in cat years. True, there is no rainbow. 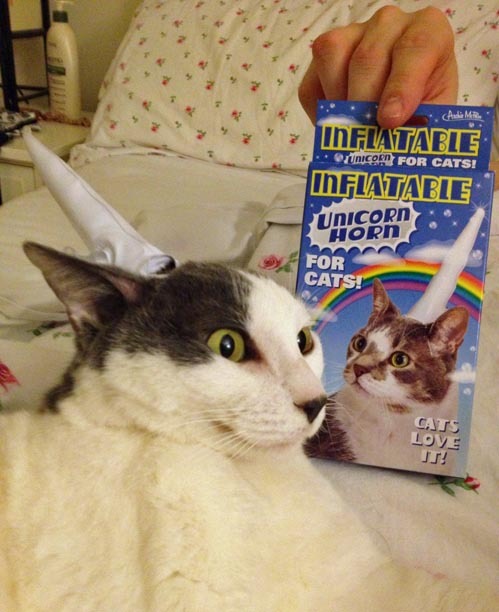 The real question is if the cat is supposed to only wear it when there is a rainbow outside, or if the rainbow is created through the wearing of the unic(horn). The mystery may never be solved. Also, this is a great option for a birthday present for Frances on the next 14th of May. Keep it in mind.